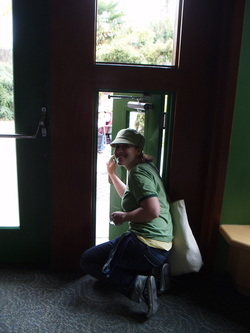 Ms. Ernst attempting the children's door on a field trip to the Oakland Zoo! Ms. Ernst with her husband. He teaches middle school! My name is Katie Ernst, and this is my thirteenth year teaching first grade at Braly Elementary School. 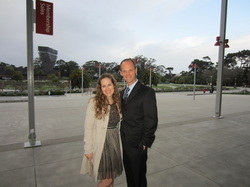 I grew up in Santa Clara, and I attended Haman Elementary and Santa Clara High School. I received my undergraduate degree from St. Mary's College of California. It was then on to San Jose State University for my teaching credential and my master's degree. Four years ago I completed training to become a Reading Recovery teacher through St. Mary's College, as well. I love teaching first grade!